How Far is Shiyam's Kalpadharu? 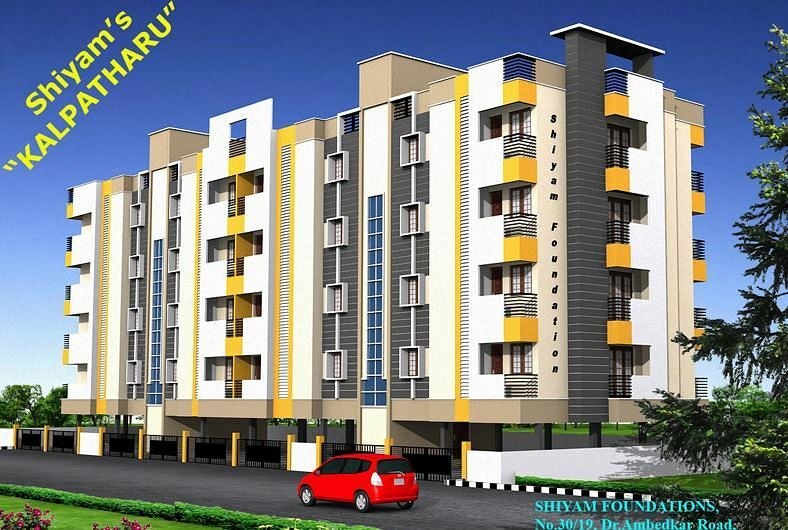 Shiyam's Kalpadharu is one of the residential project developed by Shiyam Foundations located in Kelambakkam. The building consists of stilt 4 floors with adequate CCP. Each apartment is carefully designed to ensure you get the best of everything, beautiful interiors, ample ventilation, top class amenities, high quality fittings and sophisticated accessories. R.C.C.1:1.5:3 columns for foundations & for entire super structure and R.C.C. 1:1.5:3 plinth beam at ground level connecting all the columns and 9“ thick brick work in C.M 1:5 up to basement height. Framed structure of R.C.C.columns up to roof level and 15” thick R.C.C. beam with R.C.C.roof slab. 9” thick brick work for all main walls and 41/2” thick brick work for all internal partition walls. R.C.C. 1:1.5:3 cut lintel at 7’0” height from the basement and 2’0” wide R.C.C. 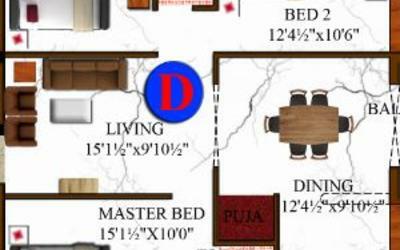 1:1.5:3 plain sunshade and 2’0” wide loft in each bedroom and kitchen. Common staircase in R.C.C flight slab with brick steps & with S.S. Hand rail with S.S Pipe railing. a) Main Entrance Door: Teak wood frame of section 5”x3” with thick teak wood paneled door of 11/4” for shutters with varnish finishing on both sides. b) Bed Room Door: Teak wood frame of section 4”x2.5” with Readymade American flush doors of 11/4” thick for shutters and matt paint finish on both sides. c) Toilet Door: Teak wood frame of section 4”x 2.5” with readymade American Flush doors of ¼” thick for shutters and matt finish on both sides. 2x2 Vitrified Tiles for the entire floor & 4” vitrified Tile for skirting. a) All the internal walls finished with wall putty and 2 coats of premium emulsion paint. b) The front elevation wall finished with wall putty and 2 coats of Ace emulsion paint. c) All the external walls finished with one coat white cement and 2 coats of Ace emulsion paint. d) All the Windows & Grill finished with chalk putty and 2 coats of enamel paint. e) Main entrance door finished with varnish. Color Glazed ceramic tiles for walls up to roof level height &anti skid ceramic tile flooring. Black Granite slab for kitchen work top with stainless steel sink. Plain ceramic tiles up to 2’0” height above Kitchen platform. R.C.C. open cub-boards with pre-cast R.C.Slabs will be provided in the bed room & kitchen without shutters. Concealed wiring using ISI materials will be provided with provision for light and fan points and plug points as normal and two way switch will be provided in rooms with inverter wiring done in all rooms. All soil water line connected to the septic tank and waste water line will be connected to the nearest canal. Concealed pipe work with hot & cold water lines with shower provisions using standard materials and necessary tap points will be provided in the toilet. Orissa Pan Indian Water Closet (Neycer/parryware Brand) and Wash Basin in White ceramic ware will be provided in the common toilet EWC closet for the attached bathroom in white color. Shiyam Foundations, an NRI venture, was established in 1992, by Professional Engineers & Architects with the prime objective of providing high value residential flats at a reasonable price. At Shiyam Foundations we are Caring, Creative and Committed and the mission is to do business with basic ethics. The company does not believe in just constructing walls connected by floors and ceiling. Instead, we create with care and imagination. Shiyam Foundations has completed more than 25+ projects covering around 3 lakh+ square feet as well as over 450+ satisfied owners in and around Chennai. At Shiyam Foundations, the objective of the construction team is to adopt appropriate construction methods using quality materials and complete projects on schedule. Unique elevation, maximum space utilisation, quality construction and timely delivery are the motives, uppermost in the minds of the construction team. Shiyam Foundations emphasises on quality materials, proper design specification and good workmanship. The company remains continuously open to suggestions from every buyer in designing their respective shell area according to their needs and satisfaction, eventhough it creates delay and material wastage. This is a unique feature of Shiyam Foundations, not offered by many builders.